Last week we spoke about the “new blood” that is coming into our market and collecting posters for the first time…or the first time in a very long while. This new interest is being partly fueled by old “Deadheads” that have now become re-energized and re-engaged by the recent 50th Anniversary Celebration of The Grateful Dead that took place over the July 4th weekend. Many of these long time, devoted fans have gone on to become successful in other areas of their lives, and can afford to own authentic memorabilia that reminds them of their participation in this past era/phenomena. At the shows in Santa Clara and Chicago, there were tens of thousand of middle aged folks that were attending their first shows in many years. Friendships were renewed, and passions re-awakened. Ever since the 50th Celebration was announced, Grateful Dead memorabilia has been flying out of the safes of collectibles dealers. To make matters even more interesting, this year also marks the 50th Anniversary of “The Sixties”, a social movement that began in 1965. 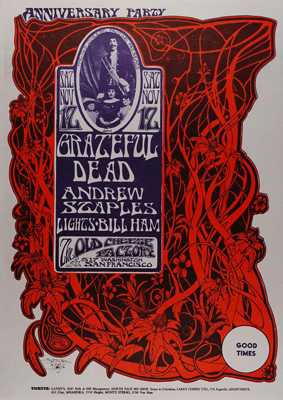 This week we are pleased to be offering a public auction that features a treasure trove of Grateful Dead Concert Posters from “back in the day!” There is a huge variety of material in every conceivable price point. Take a close look at the auction, which closes Thursday night, August 6th. To view the auction, click here!